The action from book one of this trilogy by Erika Johansen continues straight on page one, so read the first book before you open this one. At the end of The Queen of the Tearling, the neighbouring countries Tearling and Mort were on the verge of war. But author Johansen throws in a curve ball, Queen Kelsea is having visions, of a woman called Lily in what looks very like 21st century New York, with a twist. So, is this where we learn the Tearling’s Pre-Crossing history, things hinted at in book one? Yes, and no. I was left with unanswered questions – is Kelsea related to Lily? Who is Jonathan Tearling? Was there more than one ship to cross the ocean, and cross from where to where? This has left me ready, now, to read book three. I will have to wait. Kelsea is not just having visions of Lily, but of moments in history such as the sinking of a Crossing vessel and the drowning of its passengers. And she seems able to hurt the evil and heal the sick. Is it magic, or the power of her sapphires? And where did they come from? Is it the sapphires doing the magic, or is she channelling her own magic through the jewels? Kelsea is no longer a teenager girl, she is the Queen and must handle power while learning to be a woman and a leader. How should she wield her power, and who can she trust? Meanwhile, the Mort army advances. 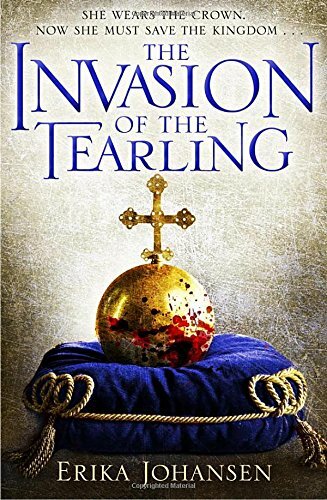 Read my review of The Queen of the Tearling, the first in Erika Johansen’s three-book series, here. No word yet on the title or publication date for the third and final instalment.